I recently tried this recipe that Jen saw in a Shape Magazine, it was easy to make and turned out great. The cheese is a splurge, but everything else is very healthy. It was a filling meal, I ate one and was full. Below is the recipe I used, we didn't have mushrooms and I made a few other small modifications. Here is the original recipe from Shape Magazine. Preheat oven to 350. Place 1/2 cup quinoa and 1 cup water in a small saucepan and bring to a boil. Reduce to a simmer, cover, and cook until all water is absorbed, about 5 minutes. Set aside and keep covered. 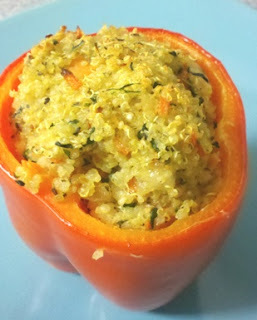 While quinoa cooks, use a sharp knife to cut the top off 2 large red bell pepper and remove the seeds and membranes; keep the pepper whole. Heat a medium skillet on medium-high; add 2 tablespoons olive oil. Add 1/2 cup minced red onion and saute until translucent, about 2 minutes. Add 1/2 teaspoon minced garlic, 1/2 cup shredded carrots, 1/2 cup baby spinach, and oregano, parsley, salt and pepper (or other spices of your choosing) and sauté until vegetables are slightly tender, about 4 minutes. Transfer sautéd vegetables to a bowl. Mix in cooked quinoa, and sprinkle with shredded mozzarella cheese. Fill pepper with the mixture. Place in a baking dish and bake uncovered for 15 minutes or until pepper is slightly charred. Serve warm or at room temperature.